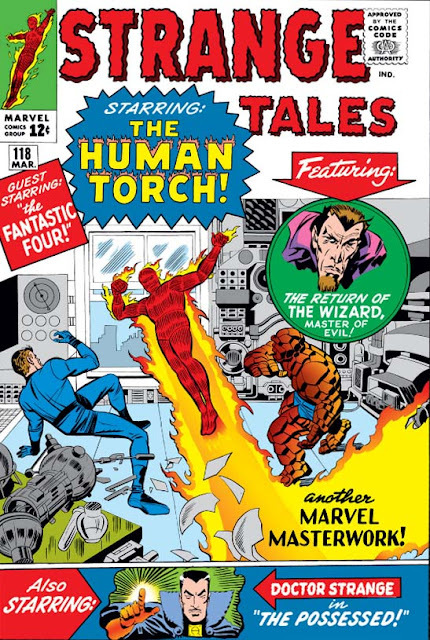 This issue features the return of the Wizard, breaking out of prison after his last tussle with the Torch. (Although there's no mention of Paste-Pot Pete, whom the Wiz was captured alongside. Perhaps the Wizard would rather forget him? Not gonna happen!) And he's got a new trick this time, as he uses his genius to give himself an upgrade, creating the anti-gravity device which will become his staple from here onward. All those battles with Johnny must be having a terrible effect on him, however, because upon his escape he concludes firstly that the safest place to hide is not away from prying eyes, but rather in someone else's identity (kidnapping the person and disguising himself as the abducted) - and secondly that the best identity for him to step into is that of the Human Torch! Y'know, teammate of the smartest guy on the planet. What sort of materials do these prison workshops provide?! and methods are not. Could this enigmatic investigator be a proto-Dr. Strange? In our second tale, the townsfolk of a small Bavarian village have become possessed by some evil force, and Dr. Strange is sent to investigate it. And what a relief! After all, this is Strange's seventh story - yet it's only the first to feature neither Mordo nor Nightmare as the villain. As a result, it also becomes the first story seemingly set on fulfilling the promise implied by Doc's debut in which he was sought out by a man troubled by bad dreams: a mystic practitioner called upon in times of ephemeral or supernatural trouble, but not necessarily the star of such troubles himself. This interpretation of Strange views him almost as our anthology host to every new month's dark secrets (and recall the lore comparing him to Vincent Price, himself soon to be a famed host of mystery and horror), often found in stories akin to "I Know the Secret of the Poltergeist! ", from Tales to Astonish #1, rather than as a brash superhero whose power is simply magic-based rather than founded in science. But given Marvel's ever-growing success with the superhero genre, it's not surprising that this is the bent the character would take, and these kinds of stories - with the Doc as an almost unknown, enigmatic character, little more than our guide to corners dark and creepy - would become increasingly rare, instead strengthening the focus even tighter on the battles between Doctor Strange and his various magical supervillains. with a feel of eerie phantasmagoria. That said, while the story itself has much to recommend, it's not without its flaws. As mentioned, the good Doctor is summoned to Bavaria to solve the problem of the possessed villagers, themselves seemingly directed by a ghostly voice which emanates from a lonely peak in the Alps. So it's a bit of a disappointment when Strange tracks down the source of this evil and discovers it to be ... alien invaders. Specifically, green-skinned, bug-eyed monsters with little antennae and a sci-fi spaceship. 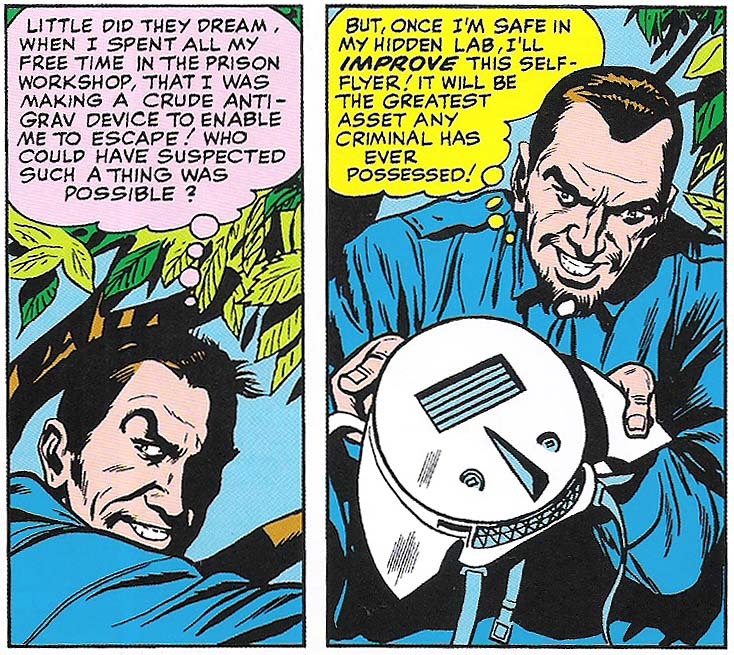 And while they're specified as from another dimension, as opposed to bad guys from "outer space", it's clear that they have a lot more in common with the Skrulls than with, say, the other-dimensional Nightmare. And it's too bad, because apart from that it's a pretty perfect standalone story with many of the standard mystical elements: possession, a quiet and unassuming village, the disembodied evil inhabiting the eerie European crags (or so it first appears), and the foreboding mystic who arrives on the scene. Having this well-constructed tableau interrupted by the interior of a 1950s B-movie spaceship really does jar, and it's because sci-fi and magic have never been able to properly inhabit the same story without one genre or the other - or, more often, both - suffering from the attempt. After all, one is about technology and the understandable sciences, no matter how advanced, while the other is about the unknown and unknowable, the forces of the dark and the spaces inbetween. Trying to mix and match the two is understandably an appealing challenge, but it almost never, ever works out. Remember that sense of unseen, ghostly dread? Yeah - gone now.